Meadow View in North Walsham, Norfolk sleeps 6 people. 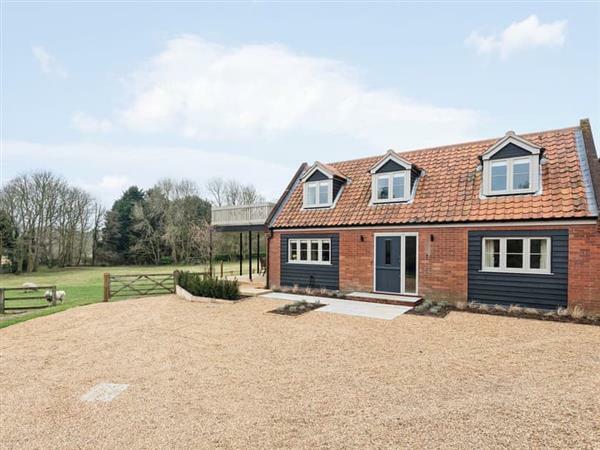 Meadow View in North Walsham has excellent walking direct from the door and is centrally located for exploring both the North Norfolk Coast and Norfolk Broads; this beautifully presented, detached conversion provides perfect holiday accommodation for families and couples. An added feature for younger and older guests is the fact that this property has a ground floor bedroom and wet room. Meadow View offers light, inviting open plan accommodation that makes a good social hub, with a well-equipped kitchen and plenty of parking. Boasting both a first floor veranda and an enclosed garden, it makes for a great place to return, relax and enjoy the wonderful views across meadow land with grazing sheep, and perfect for al fresco dining. For those that prefer eating out, the area offers opportunities with bistro pubs and award-winning fine dining restaurants locally. The house stands within the owner’s grounds, neighbouring to their home, yet commanding its own privacy. The popular market town of North Walsham, 1 mile away, offers shops, supermarkets, a train station, cafés and pubs. The seaside village of Mundesley, 4 miles away, has a wide sandy beach, golf course and village centre with shops and pubs. There are excellent walking and cycle routes available from the doorstep. Footpaths lead to Paston Way and Pigney Wood; an important wildlife woodland and wetland refuge for birds, mammals and insects such as goldcrest, nuthatch, warblers, otters, water voles, butterflies and dragonflies. Dog walkers will also welcome the close proximity of Bacton Woods, made up of 280 acres of woodland and just 10 minutes away by car. Three way-marked walks can be found here to leisurely explore and discover the 200-year-old trees. Further delightful beaches found at Trimingham and Sidestrand are within 20 minutes’ drive. Further spectacular beaches at Holkham and Wells-next-the-Sea are an hour’s drive. Wroxham, the capital of The Broads, is 12 miles away, with its daily boat hire, river trips and riverside shops and cafés. The Georgian market town of Holt is 19 miles away. The seaside towns of Cromer, 10 miles, and Sheringham, 15 miles have excellent beaches, shops, cafés and pubs. Cromer has a pier, promenade and working RNLI life boat station and museum, whilst Sheringham is home to the North Norfolk Steam Railway, which visits neighbouring and coastal villages. Well worth a visit during December and February is Horsey Beach, 17 miles away, for your chance to spot hundreds of grey seals and pups along the shore. Don’t miss a day out in the cathedral city of Norwich, 16 miles, with quaint cobbled streets and a medieval castle. Blakeney Quay for boat trips and crab fishing is 23 miles away. National Trust halls and gardens including Blickling Hall, Felbrigg Hall, Holkham Hall and Sheringham Park are within easy reach and the National Trust membership also offers free parking to many coastal car parks. The Royal Sandringham Estate and museum is 44 miles. The beach is 4 miles from Meadow View in North Walsham. With the shops, pub and restaurant 1 mile from Meadow View. Open plan living space: With wooden floor and French doors leading to patio. Bedroom 3: With king-size bed and French door leading to balcony. Oil underfloor central heating, electricity, bed linen, towels and Wi-Fi included. Travel cot and highchair. Welcome pack. Enclosed lawned garden with patio, terrace and garden furniture. Balcony with outdoor furniture. 3 dogs welcome, to be kept on a lead at all times (sheep country). Private parking for 3 cars. No smoking. Holidays at Meadow View run from Friday to Friday. Pets allowed at Meadow View. For a better idea of where Meadow View is, you can see Meadow View on the map below. Meadow View is in Norfolk; should you be on the lookout for a special offer, you can find all the special offers in Norfolk. It's always worth checking to see what is on offer at the moment. Do you want to holiday near Meadow View (UKC3929), you can see other cottages within 25 miles of Meadow View; have a look to find your perfect holiday location.